At the height of negotiations between the Iranian regime and the group of nations collectively known as the P5+1, the mullahs exercised a certain sure footedness in terms of their messaging and using the echo chamber of the Iran lobby working in concert with the Obama administration to cultivate the popular myths that the best hope for moderation in Iran was to approve the deal with major concessions for the regime. The regime was united in its public statements with Hassan Rouhani playing the useful role of moderate leader struggling against the forces of hardliners and zealots. Even the Revolutionary Guard Corps played along by putting its terrorist operations on hold around the world lest countries got jittery. In the aftermath of that badly flawed deal the Iranian regime reaped its benefits; namely billions in hard cash it quickly funneled to keep the Assad regime afloat in Syria, as well as rebuild and rearm its military and mobilize terrorist proxies such as Hezbollah and Iraqi Shiite militias to fight rebels there. The mullahs also had a free hand to crack down on dissent at home with an almost ruthless glee as Rouhani oversaw a historic increase in the number of public hangings taking place in town squares and village marketplaces all over Iran. Add to that the spectacle of parliamentary and presidential elections held without any competing candidates allowed on the ballot and you have a cozy vision of what life was like post-nuclear deal. Unfortunately for the mullahs, Donald Trump was elected president and with him came his promise to undo the nuclear deal which he fulfilled starting this week accompanied by his usual string of tweets in a blistering barrage castigating the regime and its blatant disregard for international and regional peace and stability over the last three years. It is one of those rare times in history when a country run by a bunch of theocratic, demagogues is flummoxed. No longer could the mullahs rely on their well-oiled Iran lobby PR machine to put its muscle into shaping U.S. policy. No longer did they enjoy easy and open access to the White House and State Department. No longer could they predict muted U.S. responses to any transgression such as taking more dual-national U.S. hostages or even seizing some U.S. Navy patrol boats. Instead the mullahs are faced with two very inconvenient truths: This U.S. president doesn’t trust them and is perfectly happy to put the screws to them; and the U.S. economy is leading the world economy now in growth which places its economic muscle front and center in warning off European and Asian companies to rescue the moribund Iranian economy. Even the president’s offer to meet with Rouhani “anytime, anywhere” has baffled the Iranian regime since for them, it’s a no-win situation. This conundrum is so profound that Rouhani himself has given contradictory answers in the span of the same speech. 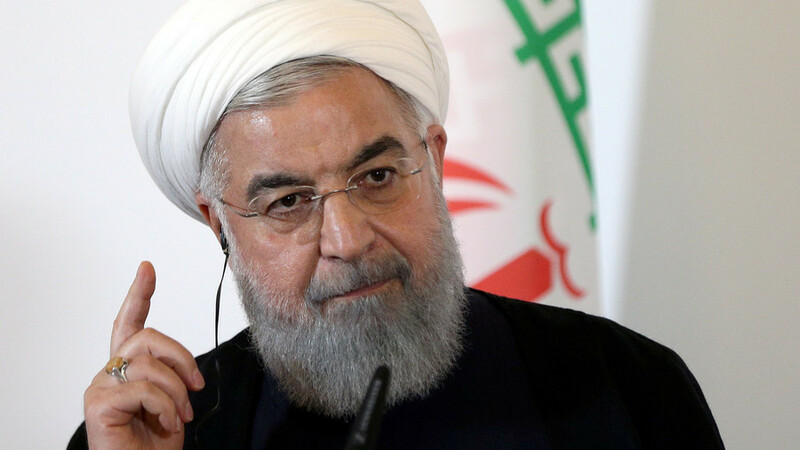 “You cannot expect to talk to a person after you stab him and leave the knife in his body,” Rouhani, speaking in Persian, told IRIB state television. Rouhani goes on to characterize the president’s meeting offer as a form of “psychological warfare aimed at his regime. “I don’t have preconditions. If the US government is willing, let’s start right now,” Rouhani said. Under normal circumstances one could write off Rouhani’s remarks as simple hyperbole, but the truth is that his bipolar remarks highlight the squeeze he and the rest of the theocracy are in as a wearying population is enraged by government corruption, endless wars and deep distrust of its leadership. President Trump made the sanctions more impactful by warning that any companies doing business in Iran would be barred from doing business with the U.S.
And it seems to be working as German carmaker Daimler AG froze a plan to make Mercedes Benz trucks in Iran. That’s even after the European Union tried to salvage the Iran nuclear deal by pledging to protect firms from Trump’s assault. All of which makes Rouhani’s efforts to praise European nations in resisting the U.S. sanctions ring all the more hollow and desperate sounding. The Iranian regime, and more importantly the ruling mullahs, are finding themselves quickly being isolated not only from global commerce but even their own people, setting the stage for what has been a longed—for goal among Iranian dissidents and opposition groups: the opportunity for real democratic reform and regime change.